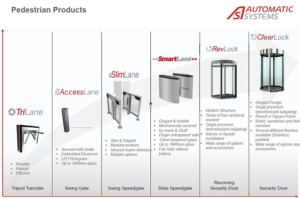 Choose from our lines of discreet, innovatively styled products that are compatible with most access control systems. Security entrance lanes are designed to achieve maximum pedestrian throughput while offering a high level of security. Their modern yet discreet designs integrate seamlessly into any architectural style. The AccessLane Swing Gate facilitates the passage of reduced-mobility users, service staff with trolleys or deliveries of bulky items as well as during the evacuation of the building during an emergency. Our easy-to-use, robust tripod turnstiles with a low profile design provide automatic access control for high traffic sites. Used primarily to secure the perimeter of fenced outdoor sites, full-height security turnstiles promote single passage and are extremely weather resistant. Double entrance and exit doors that ensure fluid throughput. Security doors combine high security and elegance (large glass surface).